So much faster – still as accurate! Tierd of reaching and trying to find the buttons to work your reading machine? Then MagniLink Voice 2 is the unit for you! The already fast machine now work three times faster – with the same precision and accuracy as before! 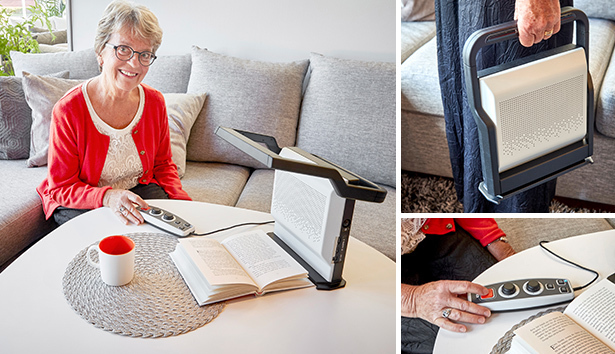 The user-friendly large buttons makes MagniLink Voice 2 one of the most easy-to-use reading machines on the market. At the same time we reduce the US MSRP price for the MagniLink Voice 2 to US$2195 from September 1. Completely updated with a huge price decrease! Updated menu system. After feedback from users and staff in visual rehabilitation, the menu system has been updated so that the unit now is even more user-friendly. Individual profiles. It is now easier to switch between simple and advanced profiles. You can save two different profiles, which can be exported and imported if you want to use them on another unit. Save OCR-processed text in different formats. It is now possible to save OCR-processed text as audio file (.wav), as a PDF or as DocX format. Navigation with computer mouse. If you connect MagniLink Voice 2 to a monitor you can take a picture with the mouse pointer and then mark in the picture which part you want OCR-processed and read. You can then navigate the computer mouse up, down, and sideways in the captured picture as well as zoom in and out. Add and cancel. Easily add additional text to an OCR treatment by holding down the orange "Take Picture" button for a while, and the device indicates that the image is added. You can easily cancel OCR processing with a quick tap on the orange "Take Picture" button. New voices and languages. The voices are updated to Vocalizer Expressive and some new languages have been added avaliable as add-ons.